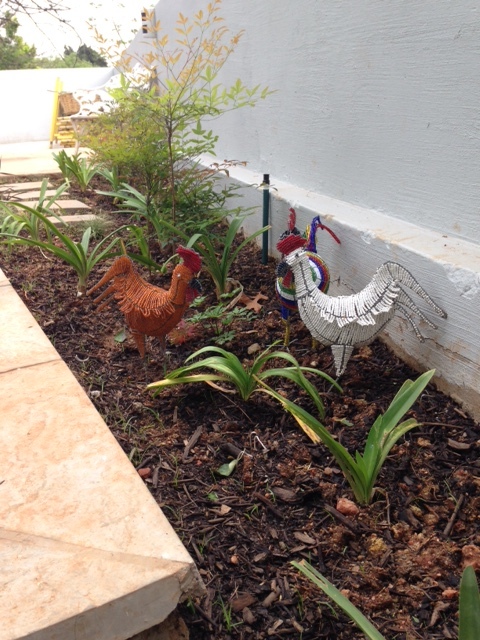 My beautiful beaded, wire chickens – made by a Zimbabwean called Stuart and bought on a nearby street corner – have finally come home to roost. It’s been a while…. Settling into a house still teeming with workmen has been quite challenging and very time-consuming but in the meantime, the garden has started to take shape and it’s all looking more like home. 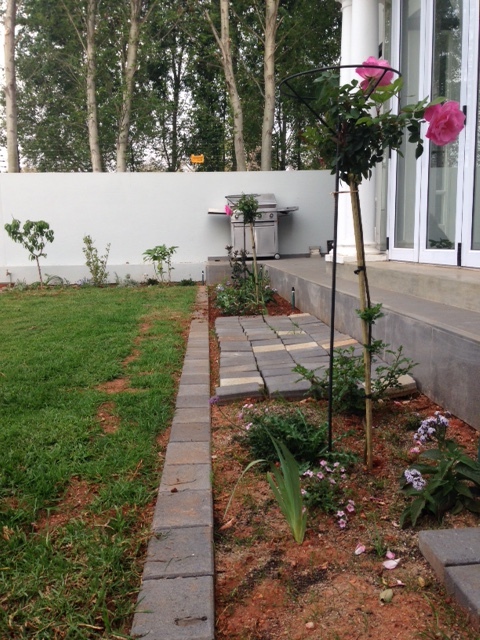 There are four distinct parts to the garden: the pavement (sidewalk) garden, the office garden, the driveway and what we call the front garden but which would probably be called the ‘back’ garden in the States. 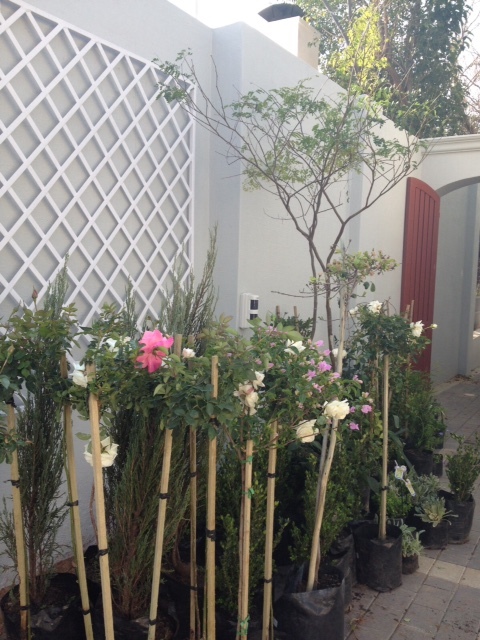 I called in the help of a friend of mine who has a small landscaping business, Parktown Gardens. Marion helped with various ‘rejuvenations’ of our old Dunkeld garden and I knew we’d understand each other here. The garden team arrives and gets started. 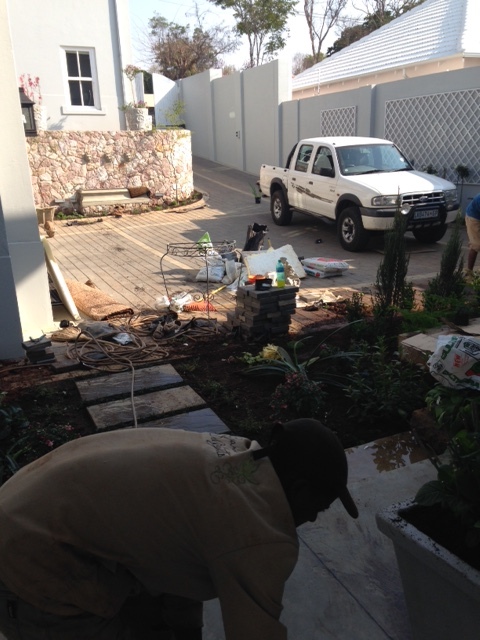 Laying out the flower beds in the front (north) garden. The bench against the wall was originally in my mother’s East London garden and has survived several moves. 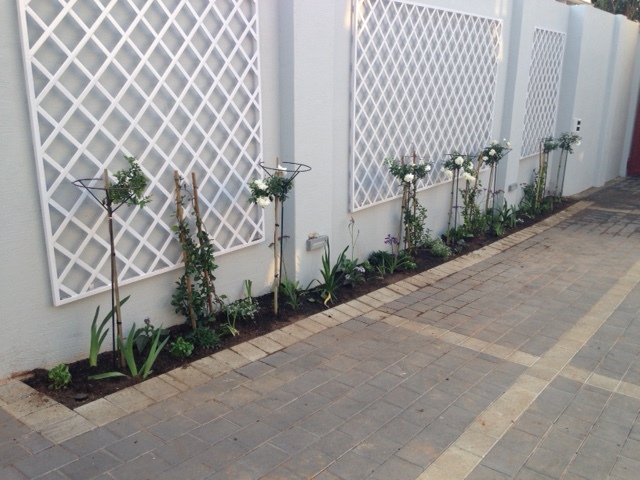 Standard Iceberg Roses, Jasmine and Agapanthus in the narrow bed on the west side of the driveway. 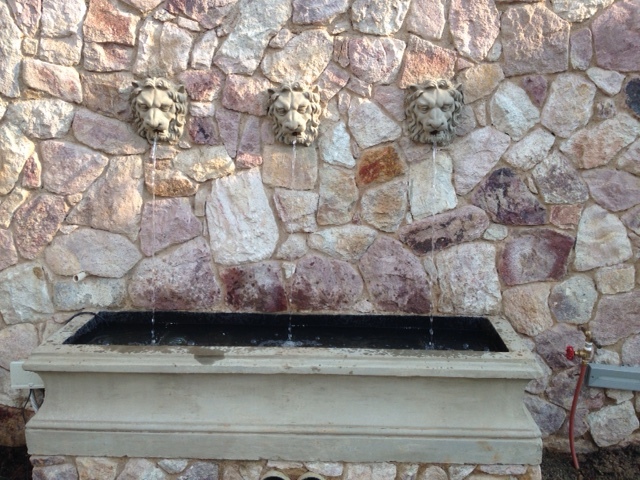 Water feature functioning at last. 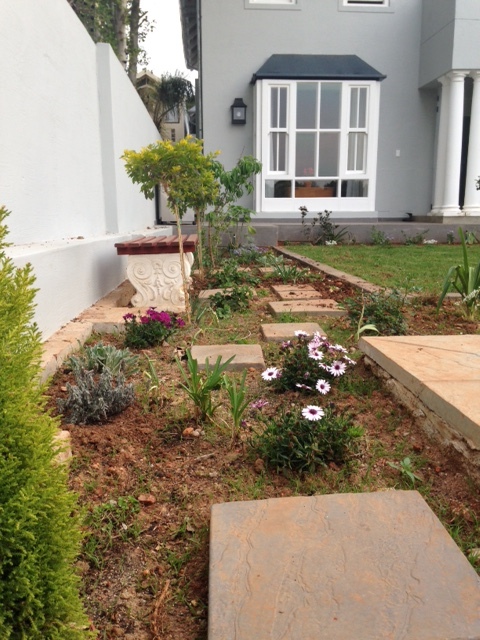 The flower bed along the front of the house. The bed along the east boundary wall. First Crested Barbets to visit. 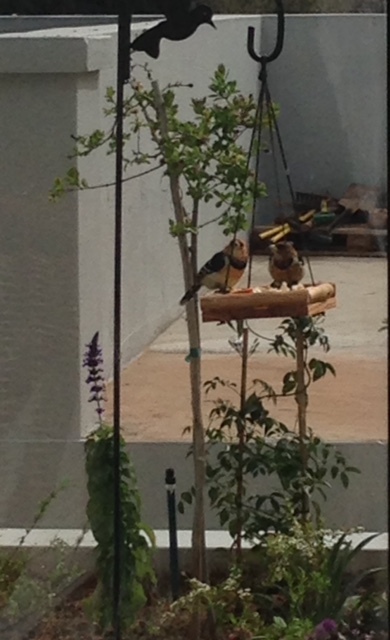 In the absence of a big enough tree, I have resorted to a metal stand on which to hang a bird-feeder. Perhaps it’s the proximity to the park but we were astonished at how promptly the local bird population came to visit. Within hours of hanging up the feeder, Thrush, Cape Robins, Grey Louries, Weavers and these beautiful Barbets had all come to their own house-warming party. As you can see, there are still building materials piled up in the corner next to the pool and we’re still waiting for the decking to be installed. 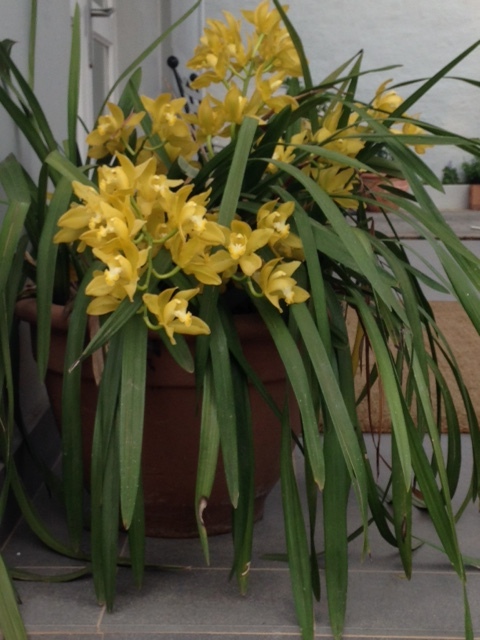 Both these cymbidiums survived the move including a few months of neglect while we were in Cape Town. The first clivia and first (white) azalea flowering in front of the office. 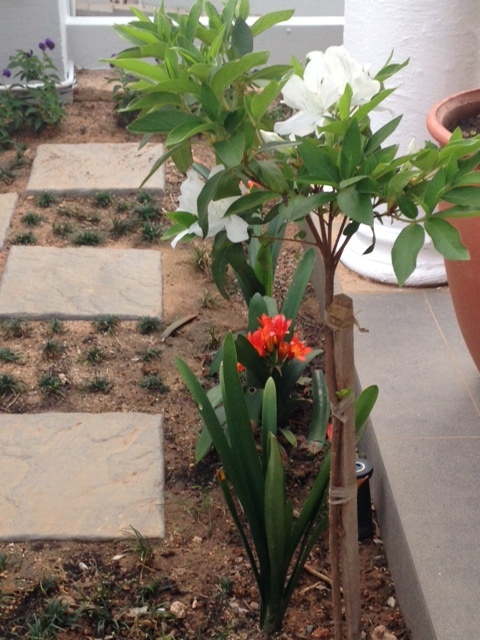 We’ve planted buffalo grass in between the pavers but it seems to be taking rather a long time to get established. 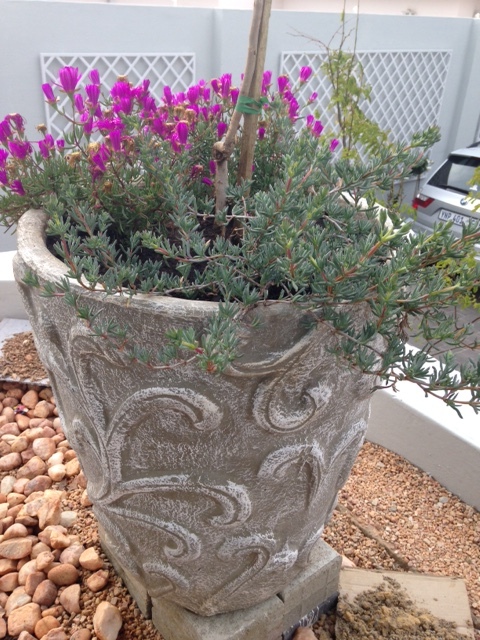 We’ve put five of these planters along the high-level bed around the office. There are bougainvillea plants in all of them, chosen to withstand the heat and in the hopes that they will eventually ‘tumble’ over the edge of the stone wall. 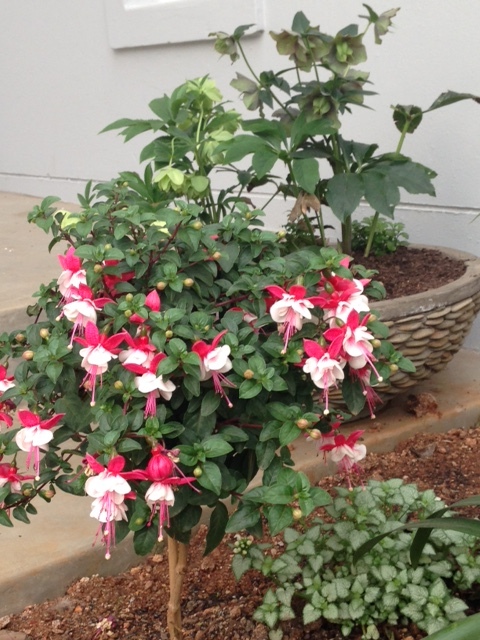 Standard fuschia next to the front step to the house. There are lots of gaps to be filled in with annuals and I hope to get to that soon. In the meantime, it’s such a relief to have a garden again and the lawn has even had its first mowing which took all of 5 minutes. 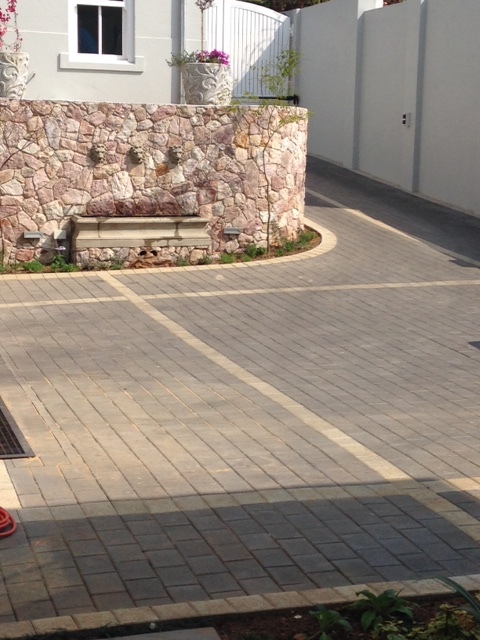 The sprinkler system is up and running and we hope our summer storms will not be too late in starting this year. Watch this garden grow! 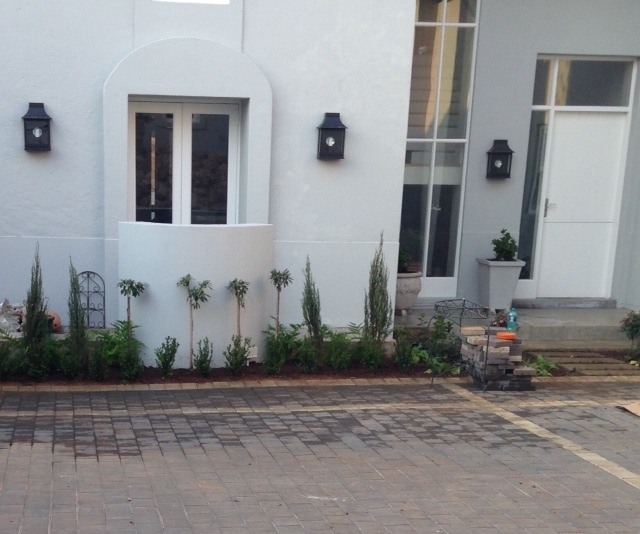 Tags Building in Parkhurst, gardening from scratch. 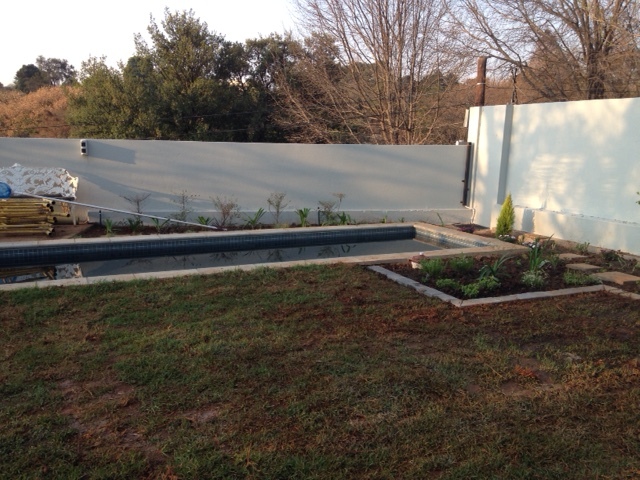 Parktown Gardens, House building from scratch. 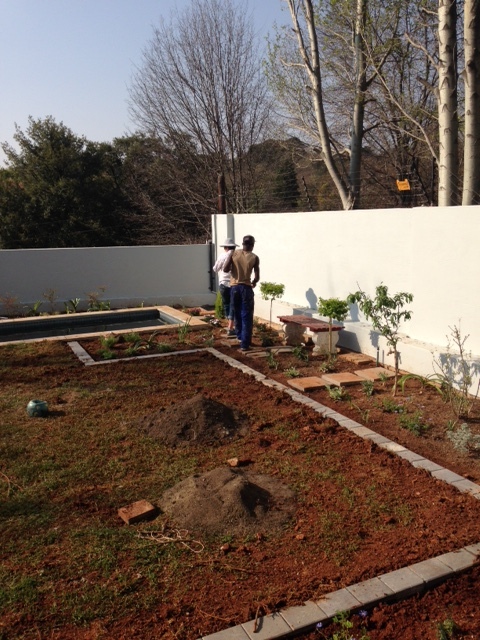 Parkhurst., Parktown Gardens, starting a garden in Parkhurst.